Once again, I'm in Japan during September 11th. It's strange to be far from home in a place where they don't pay much attention to what happened on that fateful day. For me, it is more poignant. Never forgetting means also, for me, being thankful for the subsequent protection that we've enjoyed since that day. With all of the scheming and attempts that have happened, it is truely remarkable - and a tribute to vigilance - that we have been spared further attacks. We will never forget that day. We will never forget those who defend us. We will never forget those who watch ceaselessly on our behalf. In the aftermath of the Archibishop of Canterbury's recent pronouncements about the unavoidable adoption of Sharia law in Britain, Mark Steyn's comments in the Guardian newspaper almost three years ago - these in the aftermath of the tube bombings in London - seem, well, just downright prescient. He, of course, brilliantly followed these ideas up in his outstanding book: America Alone . It does seem clear that Eurpope is indeed dead - has already succumbed. Perhaps unintended, but by his words, Rowan Williams was pounding nails into the continent's collective coffin. Like I mentioned, I'm in Tokyo - have been here since last Wednesday. Yesterday was September 11th here. I spent a good part of the day riding on trains. Part of what that meant is that I had tickets that were printed out for me that I had to insert into machines, show to conductors, and just pull out from my pocket while retrieving business cards. Every time I saw it, I could literally see that hallowed scar in the earth that I've visited so many times. I will never forget. We should never forget. Forgetting is invitation to repetition. Michelle Malkin reports that the winning design of the Flight 93 memorial will be altered due to the controversy over the 'red crescent' aspect of the design. Good. There should never be even a potential of a dilution of honor - especially in a place like this. Removing the crescent will handle the most objectionable part of the design. However, unless the design does more to memorialize the way these forty civilians galvanized the nation into action instead of defeatist paralysis, it will still do an injustice to their memory. The other elements of the Murdoch design sound and look beautiful, but communicate passivity and detachment. These qualities embody the antithesis of Flight 93, which demand action and involvement of all Americans in defiance of terrorism and the defense of the nation. Let's hope that Murdoch will rethink his design to truly memorialize what Flight 93 meant to America. Otherwise, the jury needs to literally go back to the drawing board. Do we get to make suggestions? Make the visitor center a replica of the White House or the Capitol building. At the entry put up a sign that says: "This represents the physical building that they saved. They also saved the American spirit that inhabits this place. That's what heroes do." Cover the memorial grounds with American flags - say about 40,000 of them. 1,000 for each of the heroes. You don't need to plant them in the shape of a crescent or a cross - put them everywhere - along the flight path, around the crash site, everywhere anyone might look. Let there be no question that these heroes died for our American ideals, that they died for the great cause of freedom. In a heroic stand of enormous price - in bittersweet tragic irony - this place commemorates the fact that they stayed the course. Ace says it's OK to make suggestions. I like his. I watched this fine documentary about United Flight 93, September 11, 2001, on the Discovery Channel Sunday evening. If you didn't see it the DVD is available here. This is worth watching every year on this anniversary. Someone shares during this program that in this darkest of days, the brave heroes of Flight 93 gave us hope as they fought the first battle in the War on Terror. Discovery Channel is donating all revenue from this DVD to an effort by the National Park Service to create a national memorial at the hallowed ground of the Flight 93 crash site in Somerset County, Pennsylvania. May all who visit this place remember the collective acts of courage and sacrifice of the passengers and crew, revere this hallowed ground as the final resting place of those heroes, and reflect on the power of individuals who choose to make a difference. 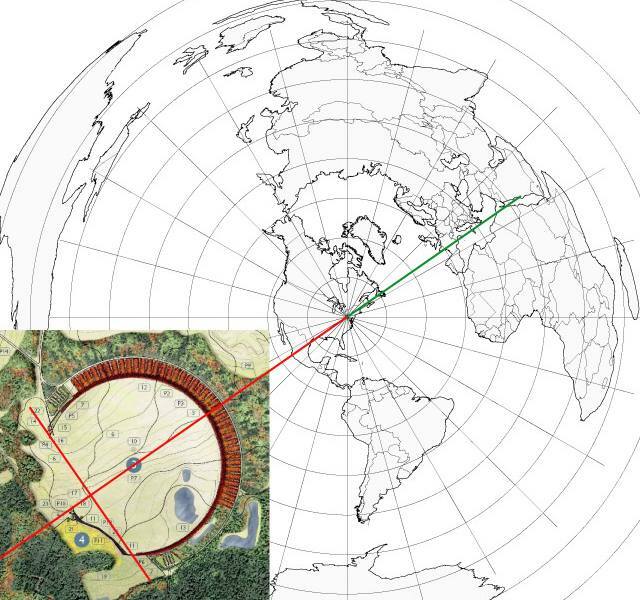 UPDATE: Turns out that the 'winning' design for the Flight 93 national memorial contains (either a purposeful or inadvertant) Islamic crescent. See Michelle Malkin here and here. See Zombietime here and (oriented toward Mecca?) here. Seems like anything that could be possibly interpreted in any way that would dishonor these heroes needs to be changed. Tucked away in the Seattle Times this week is an ominous story about the reach and connectedness of terrorist organizations and the threat that apparently assimilated Islamic fanatics bring to our shores. A federal complaint unsealed yesterday offers new details into a failed plan to set up a jihad terrorist training camp outside Bly, Ore. The complaint, filed June 20, charges British citizen Haroon Rashid Aswat, with offering material support to terrorists, knowing his efforts would be used to "kill, kidnap and maim persons and damage property in a foreign country." The camp was initially promoted by James Ujaama, a former Seattle resident who was sentenced to two years in federal prison in return for his cooperation with federal investigators. The complaint unsealed yesterday alleges that the camp was to seek fighters from the United States and London to wage jihad — or a holy war — in Afghanistan. The camp was to offer training in archery, combat, martial arts, rifle and handgun handling, all in a secure environment in a "pro-militia and fire-arms state," according to a fax cited in the unsealed complaint. Sources have said that Ujaama wrote the fax. Note this: Aswat: British citizen - in Oregon, US. Setting up a training camp to import trainees from the US and Britain and export terror to Afghanistan. Aswat was taken into custody in Zambia last month in connection with the London transit bombings. British officials want to question him about 20 phone calls reportedly made on his South African cellphone to some of the four bombers who killed 52 people in the London attack, Zambian officials say. But it is unclear what — if any — involvement Aswat is alleged to have had in those attacks. Aswat: Likely involved in the London terror. During the fall of 1999, the ranch drew scrutiny from Southern Oregon law-enforcement officials. "There were reports of gunfire and of a large group of suspicious, or unusual, people there," Klamath County Sheriff Tim Evinger said in a 2002 interview. While we attempt extradition of Aswat from Britain, we would do well to collectively ask ourselves honestly: Can we really pretend that there are no sleeper cells operating in this country? Shadow Defense Minister Haworth has the guts to speak the truth plainly. Where's our Haworth? Congresspersons? Senators? Please see Jeff's take (h/t to him as well) on this. Since at least Sept. 11, 2001, the non-Muslim world at large has been waiting for that segment of the Muslim population designated as "moderate" to resolutely denounce terrorists who, in defiling its faith-tradition, have subverted Islam into a cult of death. 1. A counter-offensive repudiating war-mongering politics, terrorism, and suicide bombings. 2. That same counter-offensive isolating the extremists politically and socially. 3. Explicit support for the global war on terror. 4. Spontaneous or organized demonstrations in support of the victims of terror. 5. Spontaneous or organized demonstrations in unqualified condemnation of extremists who exploit Islam for criminal purposes. 6. Resolutely taking back their faith-tradition from extremists and murderers. 1. In the face of mounting atrocities Muslims have remained publicly complacent. 2. Their religious leaders are divided on what a proper Islamic response should be to terrorism and suicide bombings . 3. They provide endless explanations that jihad, though misguided, is a response to the wrongs inflicted on Muslims by the West. 4. They foster societies where dissent is frowned upon and opposition might be branded as seditious. 5. They malign and ostracize the singular or small groups of Muslims that unapologetically condemn the culture of violence and extremism among them. While Mansur rightly lauds the small number of Muslim individuals who work for reform, he concludes that "moderate" Muslims are indeed a myth. Given this state of affairs, in the light of the recent events in London, could there be no more clear clarion call for our society to break out of its multicultural malaise and alter the grave vulnerabilities we are exposed to? To loosely quote Mark Steyn from his column this week that I just posted about: The London bombers appeared to be assimilated - but they had no allegiance to the society into which they appeared to be assimilated. This is one of the fundamental lessons of 7/7. Mansur writes that "Consequently, what might pass for "moderate" Muslims, the large number of Muslims unaccounted for as to what they think, in practical terms constitute a forest within which extremists are incubated, nurtured, given ideological and material support, and to which they return for sanctuary"... and this really demonstrates the clear and present danger that we face in the world's democracies. It is why I have been arguing that we need for the trees in the forest to clearly declare their allegiance - and invite such demonstrations of "moderation" that Mansur prescribes. If the unaccounted for as to what they think will not do that - and we must find the cultural and political will to do so - we must take up our own "moderate" counter-offensive and isolate them and if necessary deport them - to prevent "a forest within which extremists are incubated, nurtured, given ideological and material support, and to which they return for sanctuary". The time is up for our own complacency. The mangled bodies and blood in the streets of London say that it is. And today, the attacks there continue. H/T Gail at Scribal Terror for the Mansur piece as well as her thoughts that I value.